A Cowen analyst downgrades the stock to underperform from market perform and cuts the price target by $10 to $40 a share. 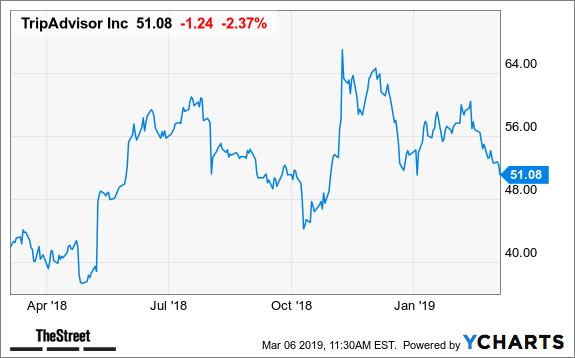 TripAdvisor (TRIP - Get Report) shares fell 3.67% to $50.40 Wednesday after Cowen's Kevin Kopelman downgraded the stock to underperform from market perform and cut the price target by $10 to $40 a share. A note to clients from Kopelman said 2019 was off to a weak start that has not yet been reflected in the stock price, usage is starting to decline across the platform, competitive share losses to Alphabet (GOOGL - Get Report) are increasing, and TripAdvisor's top advertisers Booking (BKNG - Get Report) and Expedia (EXPE - Get Report) both cited pressure in Europe. Over the past three months, analysts have lowered their consensus price target by 4.5%. Forecasts range from $40 to $78, according to Bloomberg. One of the world's largest travel sites, with more than 700 million trip reviews, TripAdvisor has two buy ratings, 18 hold ratings and six sell ratings on the stock, according to Bloomberg.